Hoffenheim had little difficulty dispatching Hannover 3-0 in a result that should have been more decisive. Joelinton and Ishak Belfodil both found the net early on, with Kerem Demirbay grabbing a late goal that his performance deserved. 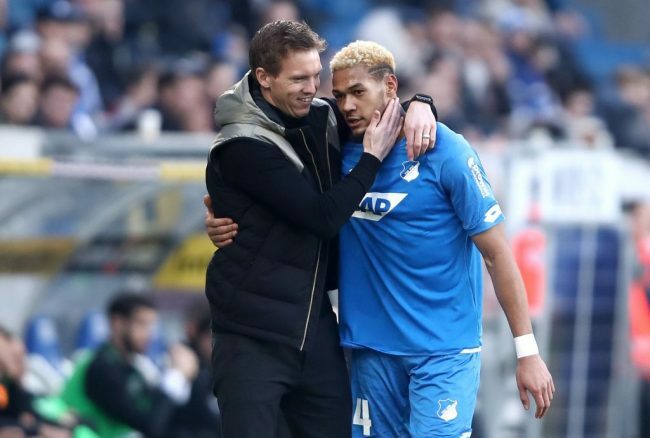 Hoffenheim produced an improbable come-back at Dortmund and kept the momentum going with Joelinton putting the hosts ahead in the 4th minute. Belfodil steered a Kerem Demirbay free-kick home to make it 2-0 in the 14th minute which effectively ended the contest. 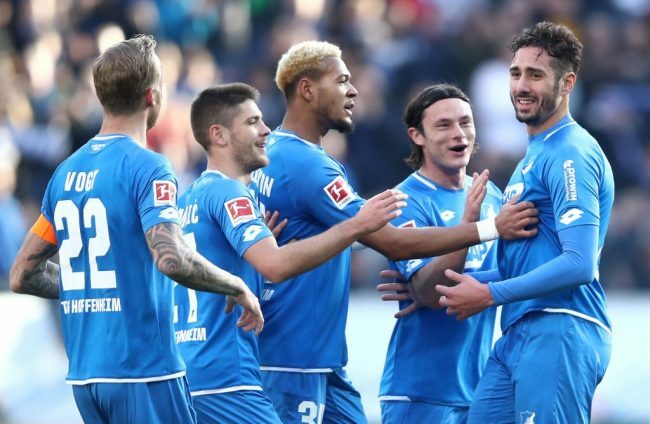 Julian Nagelsmann’s side had multiple opportunities to extend the lead before Kerem Demirbay sealed the three points in the 80th minute. This was one-way traffic throughout and the very definition of a routine win. Kevin Vogt returned to the starting line-up and his experience was important next to Stefan Posch and Kasim Adams. Dennis Geiger and Florian Grillitsch missed out here but Demirbay was back to his best in a man of the match performance, Nadiem Amiri doing well in his second start of the season. The victory was absolutely necessary with tough road fixtures coming up in Leipzig and Frankfurt. Hoffenheim’s Europa League qualification hopes remain alive in a battle that could go down to the wire. 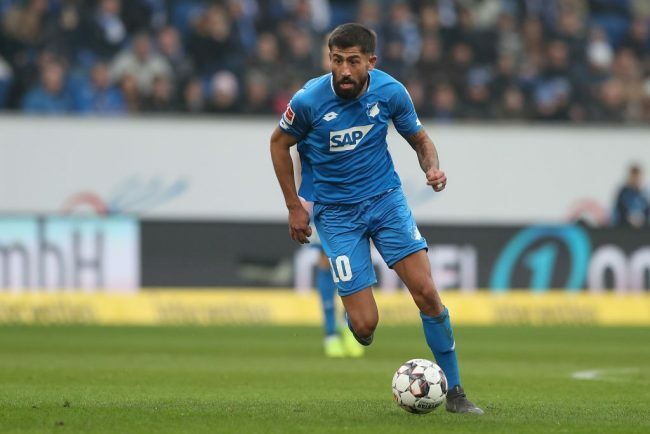 Kerem Demirbay was subbed off alongside Andrej Kramaric at half-time in Dortmund in a symbolic statement from Nagelsmann. Both players are arguably Hoffenheim’s best and were back to prove a point against Hannover. Demirbay assisted Belfodil with a free kick before smashing a volley off the underside of the crossbar. The 25-year-old was everywhere in the absence of Geiger and Grillitsch and got his deserved goal after being set up by Nico Schulz. Demirbay hit the woodwork again with Michael Esser beaten in what could have been a hat-trick on another day. 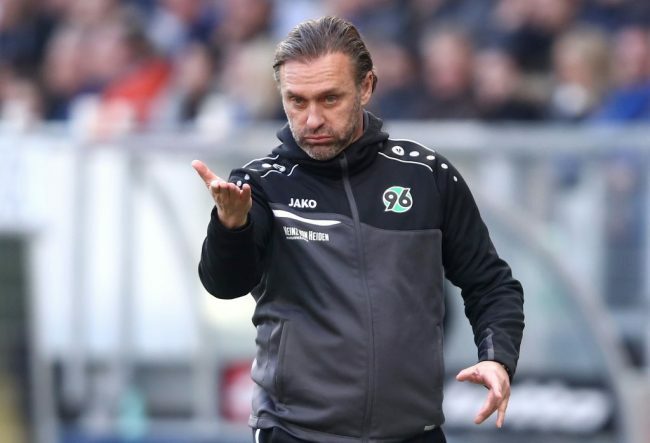 Hoffenheim need him at his best if they are to get back into Europe and despite the woeful opposition on display, he might be close to the mark. 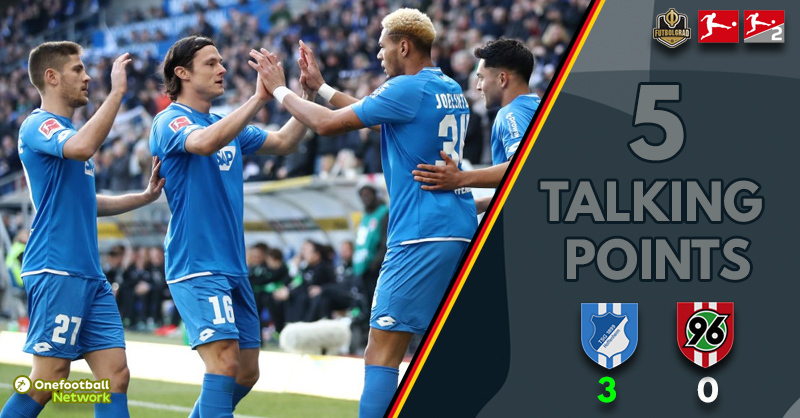 We have seen a number of attacking combinations from Nagelsmann this season but the Joelinton and Ishak Belfodil duo might be the best. Belfodil scored twice off the bench in Dortmund and showed once again that he is an underrated player, his impressive footwork on display on more than one occasion. The 27-year-old narrowly missed an early effort but got his goal and could have been involved in more. A close-range header was somehow saved by Esser on the line and some impressive combination play with Kramaric, Schulz and Leonardo Bittencourt went close to creating goals. Joelinton opened the scoring and missed two presentable chances to add to his tally but continues to be indispensable. The big Brazilian was frustrated with those misses and needs to be more clinical, but his partnership with Belfodil shows plenty of promise and should be further developed in the coming months. 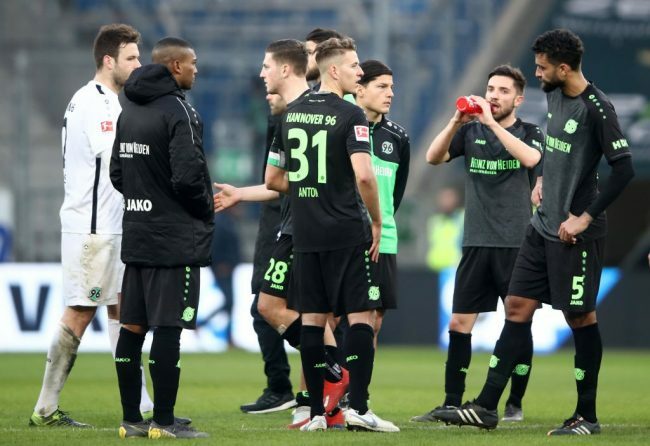 I’m running out of material to describe how bad Hannover are, and little has changed since my comments after the 5-1 defeat at Borussia Dortmund. That was Andre Breitenreiter’s last match in charge and Thomas Doll is on a hiding to nothing. This team is terrible and injuries to Linton Maina, Ilhas Bebou and Niclas Füllkrug haven’t helped. Regardless, what was on display today was horrific with their only shot on target a Matthias Ostrzolek shot from distance straight at Oliver Baumann. Free kicks and defensive clearances went straight to Hoffenheim players, they gave away cheap possession in their own half and had virtually no idea how to construct an attacking sequence. Julian Korb’s early header that allowed Joelinton to run through and score was just the start of another nightmare from the Reds. Felipe returned to the starting XI and was one of the main culprits with a number of woeful clearances that presented chances to Hoffenheim. Jonathas looks like he would rather be at Copacabana than fighting a relegation battle in the German winter and who could blame him. Thomas Doll was brought in to replace Breitenreiter and must be wondering if it was worth it. He cut a dejected figure after the match and one wonders how he can project any positivity on a squad devoid of confidence. The 2-0 home win against 10 man Nürnberg was largely irrelevant with their true colours back on display in Hoffenheim. Doll lined up in an identical formation to Nagelsmann which was always going to be a problem when his players are inferior. No notable formation or personnel changes during the match did anything to turn the tide. There is insufficient space to list all their issues here, but since they appear incapable of playing football perhaps the best and only option is playing Hendrik Weydandt and Jonathas up front and pumping long balls into the box.